Including the long-awaited addition of Android Auto! Even though the Tacoma is far from the newest truck in the mid-size segment, Toyota isn't just going to throw in the towel to newcomers like the Ford Ranger and Jeep Gladiator. The Tacoma has been the best-selling mid-size pickup truck for the past 14 years and Toyota hasn't been scared off by a few new entrants to the segment. Last week, and the updated truck has now arrived at the 2019 Chicago Auto Show with a slew of new upgrades. The Japanese automaker is so proud of its upgrades for the 2020 model year, it has told the competition to "Bring It." All 2020 Tacoma models receive a new grille design and updated wheels (depending on the specific grade). Toyota will offer more than 30 configurations in six model grades including SR, SR5, TRD Sport, TRD Off-Road, TRD Pro, and Limited. All SR5 and above grades will benefit from a new 10-way power-adjustable driver seat with power lumbar support and a new eight-inch touchscreen display (the SR receives a seven-inch screen) with Apple CarPlay, Amazon Alexa, and... Android Auto! Yep, you read that correctly, the Tacoma (along with the 4Runner, Sequoia, and Tundra) will be the first Toyota models to receive Android Auto. Toyota says it is working to add this capability to other models (including Lexus vehicles) but does not have a specific time table at this moment. Toyota has also added a new (optional) LED bed lamp which is brighter and consumes less energy. In addition to the changes found on all 2020 Tacoma models, each individual grade will receive its own unique upgrades. The base SR trim, for example, receives intermittent wipers, darker taillight housings, and the optional LED bed light. The higher SR5 trim adds 16-inch dark satin wheels, even darker taillight housings, and new fabric design on the seats. Stepping up to the TRD Sport adds 17-inch wheels, smart key, chrome taillight inserts, LED fog lamps, and an available Panoramic View Monitor (PVM) with cameras positioned around the truck to make off-roading even easier. TRD Off-road models also benefit from TRD-tuned Bilstein shocks, a locking rear differential, Hill Assist Control, Multi-Terrain Select, and Crawls Control. There is also an available Multi-Terrain Monitor (MTM), which allows the driver to pick from different camera views while off-roading. The Tacoma Limited is the most luxurious of the grades with 18-inch wheels, standard LED headlights, smart key, and standard MTM. All Tacoma grades come with Toyota Safety Sense P as standard, which includes pre-collision with pedestrian detection, lane departure alert, auto high beams, and adaptive cruise control. 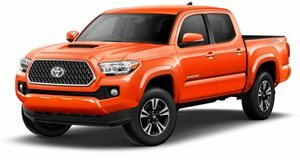 The Tacoma TRD Pro is the most off-road capable grade and arrives alongside updated TRD Pro versions of the 4Runner, Tundra, and a new entrant, the Sequoia. Toyota is offering an exclusive color called Army Green on the 2020 Tacoma TRD Pro along with Super White, Midnight Black Metallic, and Magnetic Grey Metallic. Opting for the TRD Pro also adds trail assistance to the MTM, which can look at the terrain under the vehicle. New for 2020 is a lighter 16-inch wheel, updating tuning of the Fox bypass shocks, and Goodyear Wrangler All-Terrain Kevlar-reinforced tires. Toyota will offer two powertrains, which are pretty much unchanged from the 2019 model. A 2.7 four-cylinder delivers 159 horsepower and 180 lb-ft of torque while a 3.5-liter V6 produces 278 hp and 265 lb-ft of torque. Both are mated to a six-speed automatic while the V6 can also be paired with a six-speed manual. Expect to see the 2020 Tacoma arrive in dealerships summer 2019.